Henno Martin, age 77, on the terrace above his first 1940 campsite with Hermann Korn (compare with Fig. 8), during his last trip to Namibia in 1987. Photograph: Dudley Corbett. 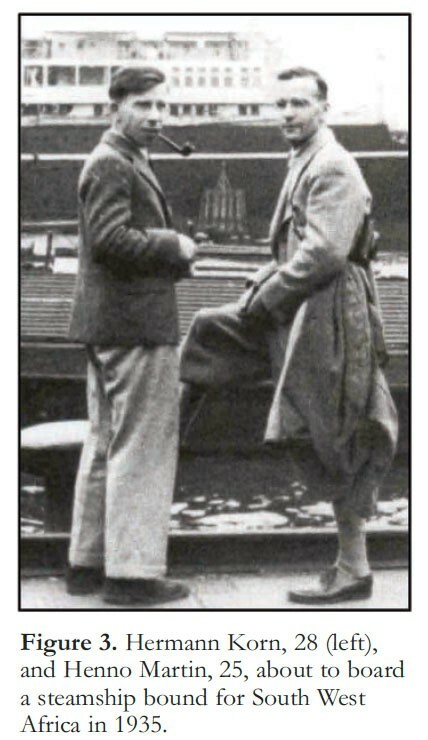 Hermann Korn, 28 (left), and Henno Martin, 25, about to board a steamship bound for South West Africa in 1935. Figure 7. 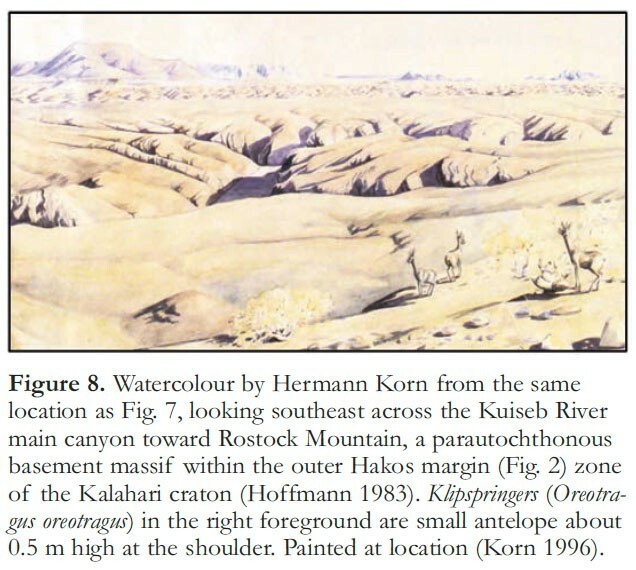 Watercolour by Hermann Korn of the view looking north toward the Goagas Mountains from the roof of their first campsite at Carp Cliff. Another view of the canyons with Carp Cliff on the left hand side. The rugged gorges of the Kuiseb canyon called the "Gramadoelas" by Henno Martin. 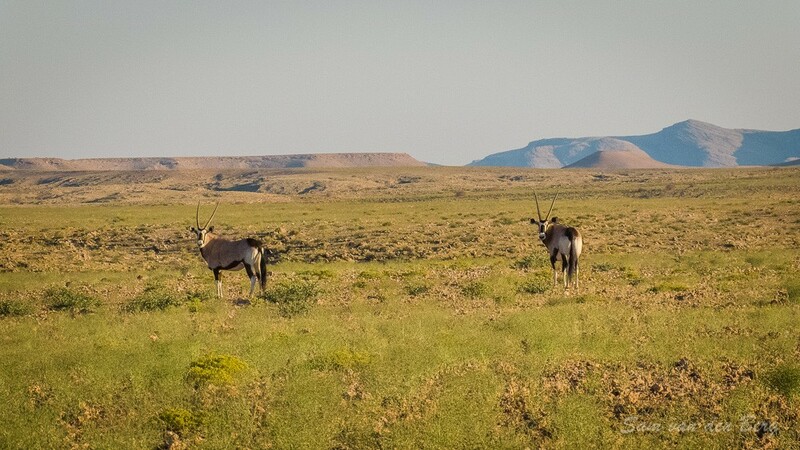 Oryx on the plains above Carp Cliff after some rain. 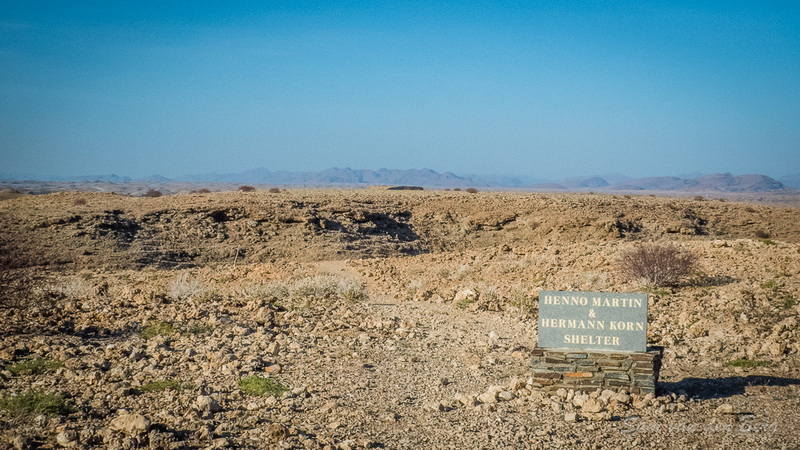 The story of two German Geologists, Henno Martin and Hermann Korn hiding in the Namib Desert for two and a half years during WWII, is well known amongst Namibians but lesser known amongst visitors. They might be perplexed by encountering this sign at the Kuiseb Canyon viewpoint. Below is the story of these remarkable men in brief, following the timeline as presented by Robert Raderschatt on his website http://www.namutoni.de. 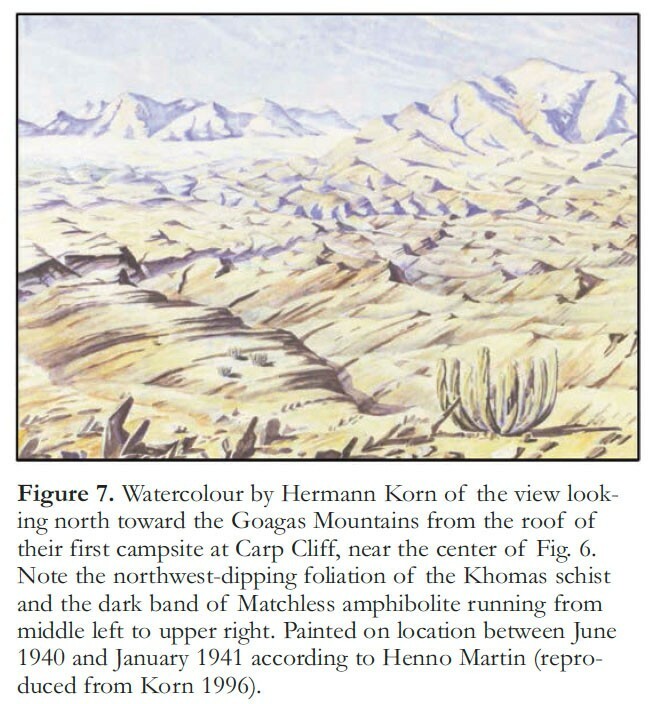 Apart from Henno Martin’s book “The Sheltering Desert” the book by Deon Silva The Ultimate Guide to Henno Martin's "The Sheltering Desert" is recommended reading for anyone that want to retrace the footsteps of Henno Martin and Hermann Korn. The Ultimate Guide to Henno Martin's "The Sheltering Desert" is obtainable from Amazon.com. 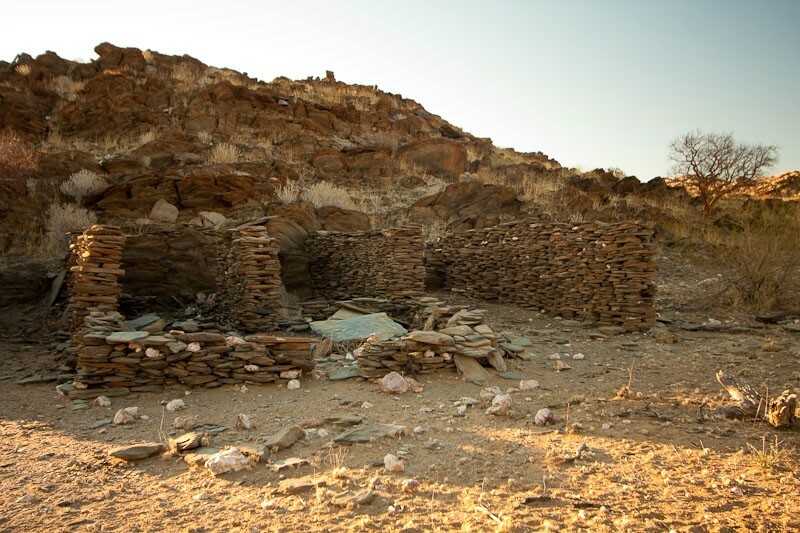 https://www.amazon.com/Namibias-Sheltering-Desert-Ultimate-Martins-ebook/dp/B012OP0GCU. The Sheltering Desert is now in the public domain and can only be bought second hand (if you are lucky) A full pdf copy is available here. They arrive exhausted in Swakopmund on September 13, 1935 where they spent some time to acclimatise. In Swakop they make many acquaintances and visited the seal colony at Cape Cross. They continue to Windhoek, where the truck and trailer were adapted to desert conditions. October / November 1935 - Their geological research began in the Naukluft Mountains, an area of about 70 x 35km. On Friday September 1, 1939, they heard on the radio that Nazi Germany had invaded Poland. By midday Sunday, the United Kingdom and France had declared war on Germany. The United States declared its neutrality on Tuesday, but earlier in the day when South African Prime Minister Barry Herzog failed to gain support for neutrality in his caucus, he was replaced by Deputy Prime Minister Jan Smuts, who declared war on Germany the following day. (Hoffman Paul F.; 2013) World War II had begun. In the middle of the month, the internment of Germans living in South West Africa begins, in particular the Nazi-active persons. Thus, the two geologists remained free for the time being, but had to hand in their hunting weapons. They could carry on with their work subject to certain conditions. By the end of 1939, 77 people were interned, which increased to 96 by March 1940. Hermann Korn wants to flee but Henno Martin hesitates. Finally on May 25 1940, after four days of packing, they left scraps of paper in the trash with tallies of gasolene needed for a trip to Brandberg. With Hermann Korn's dog Otto, a pickup truck and a Chevrolet passenger coupe and without hunting weapons, only with a pistol and a shotgun they drove halfway to the Brandberg, before turning off into the hills at dusk. 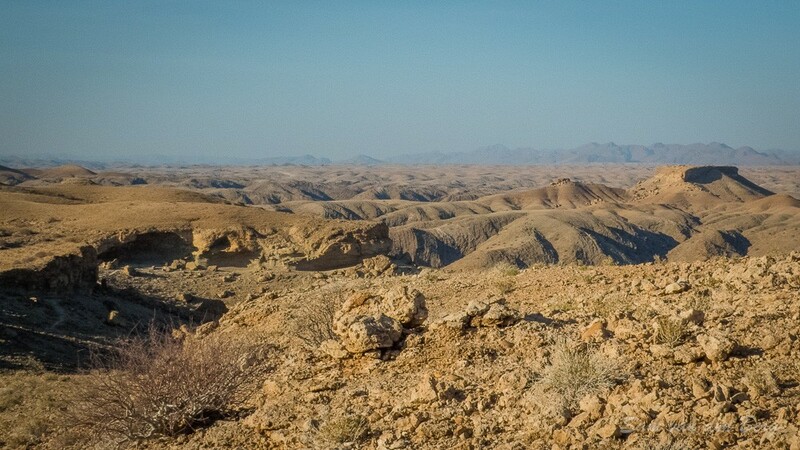 After dark, they slipped off to the southwest on a little-used track heading into the hyper-arid Namib. 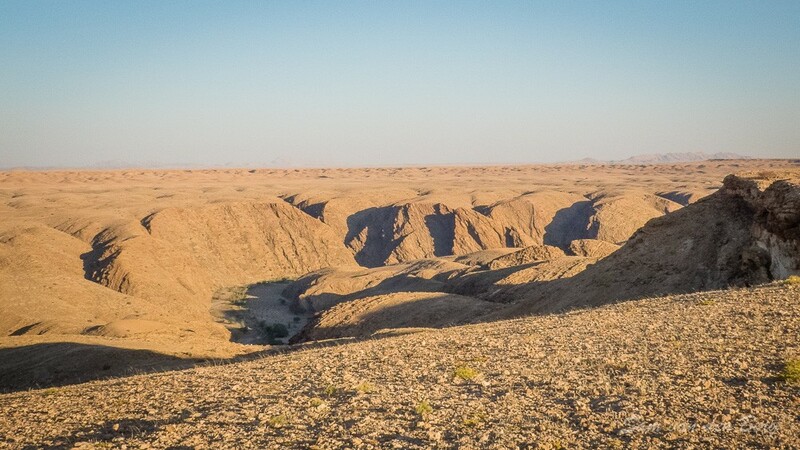 Driving only at night, for fear of being seen in the open desert from the air, they crossed the Swakop River - loose sand at this time of year - and circled back toward the southeast until they reached a maze of schist-rock canyons in the upper Kuiseb River catchment (Fig. 6). There, they hid their vehicles and for the next two years plus 100 days, they lived in total isolation, connected to civilization only through a short-wave receiver. 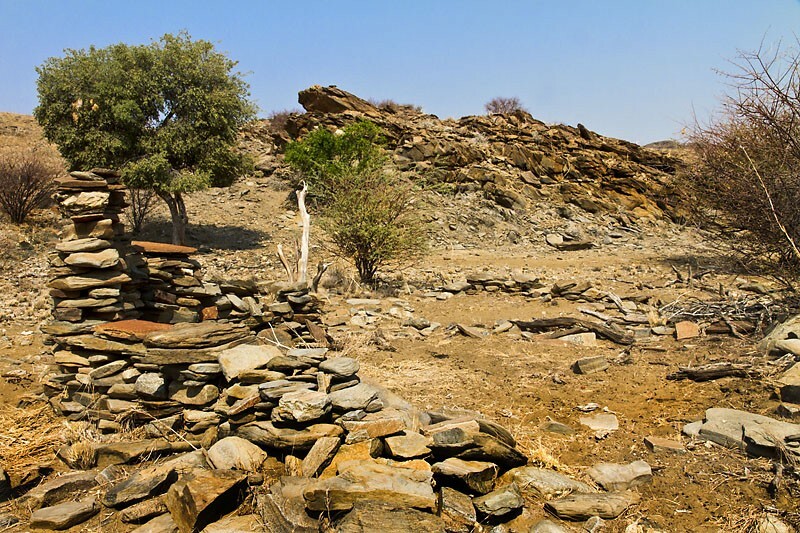 Their cars were hidden in a gorge 5km north of the shelter. They removed the battery and carried it back to power their radio enabling them to follow the course of the war and listen to symphony concerts over Radio Cape Town. They only had what they could bring with them. Supplies were limited and basic (flour, sugar, tobacco, etc.). But they were not alone in the desert and they could learn to catch and trap what they ate. Accordingly their days were spent in the neverending circle of survival namely finding food and water. They also carried on with mapping the environment and their geological research. There were a few emergency visits to the Siedentopfs, such as the emergency care of Otto after he was “spiked” by an Oryx. October 1940 - The Beginning of summer and hot weather. The water in the pools began to sink. Although the first rain clouds have been in sight for six months, there is no rain at the Carp Cliff. During November 1940 they dicovered the Nausgomab Rivier during a 3-day hike along the Goagos Mountains. Christmas time 1940 The first rain for nine months but at the end of January 1941 the water situation at Carp Cliff was so bad that the game moved away! Henno and Hermann also decided to move to their 2nd hiding place at Nausgomab on the edge of the Niedersachsen farm. They build a house from flagstones prevalent in the area. The hunting was good from a hidden vantage point at the Bitterquelle but they decided to move the hunting away from the spring so as not to frighten the animals away. Because of the contamination of the waterhole by baboons, they called the third dwelling the Baboon’s Hole. 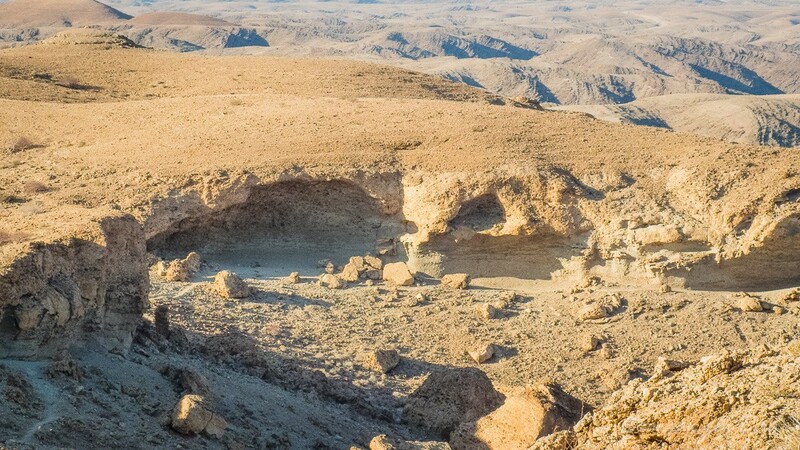 Although the Carp Cliff and the Nausgomab hiding places take up most of Henno Martin's book, they spend the longest time of their escape at the Baboons Hole. (about 11 months). October 24, 1941 It was Hermann Korn’s 34th birthday and housewarming "Hauseinweihung" at the Baboon’s Hole. The mood was sombre though as their food supplies were running low. No coffee and Hermann’s tobacco was finished. The game moved after rain fell eighty to ninety kilometers away. After the rain they laid out a small garden but the game was scarce as they did not have to come to the pools for water. 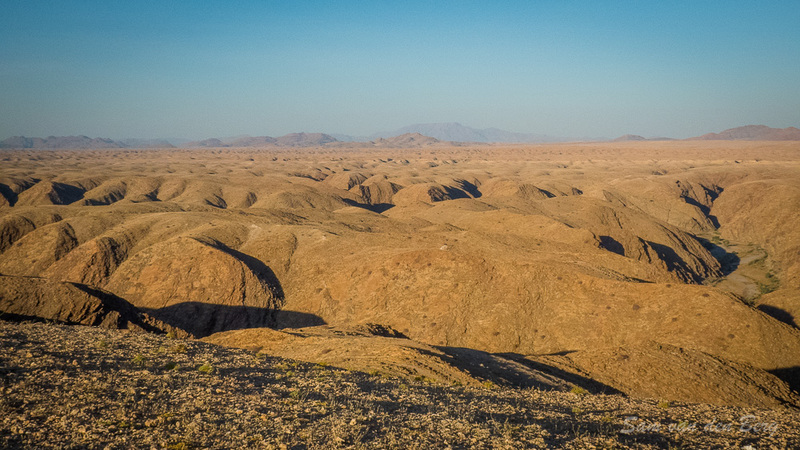 During the ensuing months they embarked on a number of multiday excursions into the Namib. Hermann, however, became seriously ill with beriberi. 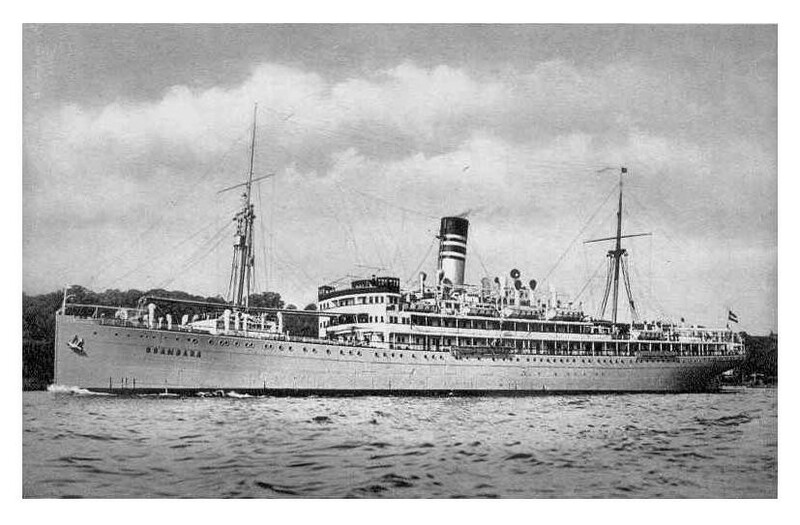 Finally on the 2nd September 1942 Hermann’s condition forced them to seek medical help. 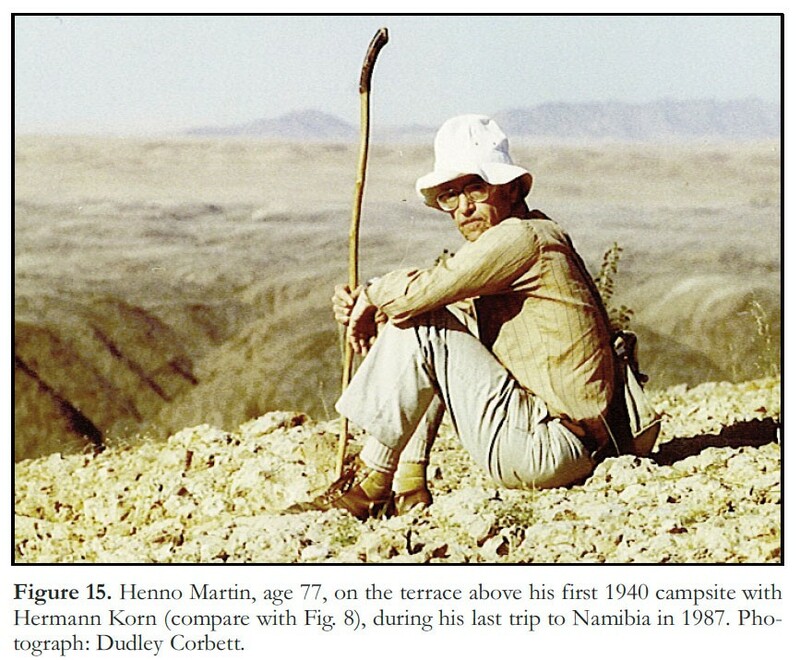 Henno drove him to Windhoek and then returned with Otto to the desert by the original circuitous route. Herman was convinced that Henno would not be able to survive on his own and gave the location to the police. Henno, was arrested by a well-armed detachment and taken to Windhoek. He spent two days in jail and two weeks in isolation in hospital, before Hermann was well enough for them to face a magistrate, charged with a long list of minor offences. They were given a small fine, paid by friends, and released. Before the end of the war, they were hired by the government to conduct groundwater exploration. (Hoffman, Paul F. ; 2013). The professional life separates the two in the following years. 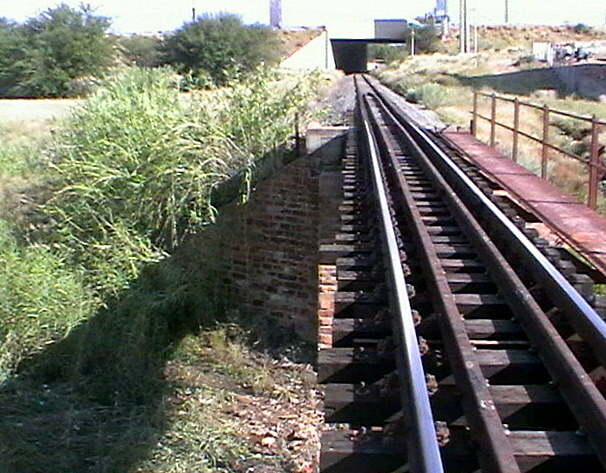 August 9, 1946 at 22:30, southwest of Windhoek Hermann Korn is killed when he drives his car at high speed along railway tracks and the car fell from a railway bridge into the dry Gammams Rivier. Hermann Korn, 38 years old, died instantly. Whether this was the result of oversight, recklessness or suicide remains unanswered. 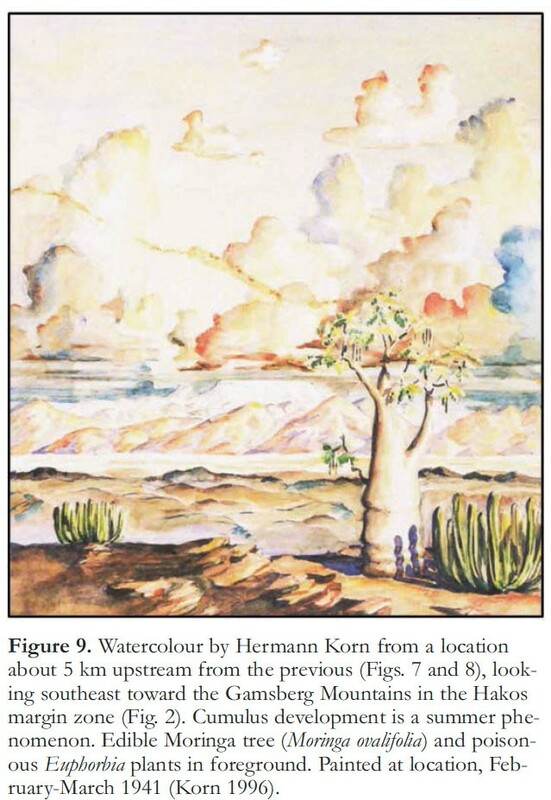 In 1947 Henno was appointed director of the SWA branch of the South African Geological Survey, a position he held until 1963. Martin, H., 1983, The Sheltering Desert (English translation by Wiliam Kimber, 1957): AD Donker, Parklands. Website : https://journals.lib.unb.ca/index.php/GC/rt/printerFriendly/geocanj.2013.40.003/23527 - Accessed on 10/06/2018 - Hoffman, P.F., 2013, The tooth of time: Henno Martin - Geoscience Canada, v. 40, no1.